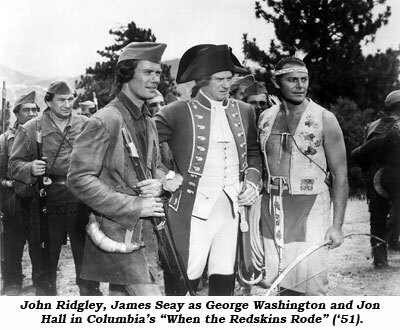 Designed for romantic leads, 6' James W. Seay (pronounced Say) was signed by Paramount in ‘39 but seemed to become caught up in a series of lesser roles at Paramount and other studios, including Republic where he made his first western playing a blind veteran of the Spanish American War helping out The Three Mesquiteers in “Oklahoma Renegades” (‘40). He achieved top flight character actor status as a villainous gang boss in Columbia’s “Face Behind the Mask” (‘41) w/Peter Lorre and the late Evelyn Keyes. Born September 9, 1914, in Pasadena, CA, his father was Chester Seay of Virginia and his mother was Mabel Seay of Colorado. At various times his father worked for the railroad, a ship building company, and as a building contractor. By 1920 his parents were divorced and James was living with his mother and two older brothers (Robert and John) in Pasadena. His mother was supporting herself doing housework. Choosing acting as a profession, Seay’s first known film was “Back Door to Heaven” in ‘39. The durable, dependable Seay never quite reached the top ranks of stardom, but remained on film for some 200 movie and TV roles through 1970. After a quite busy start…12 films in ‘41, 12 in ‘42…Army Air Corps service 11/14/42 to late ‘45 or early ‘46 took some of the momentum out of his career, nevertheless he returned in ‘47, frequently in later years focusing on small but attention getting character roles, often in an authoritative position lent credibility by his strong commanding voice. 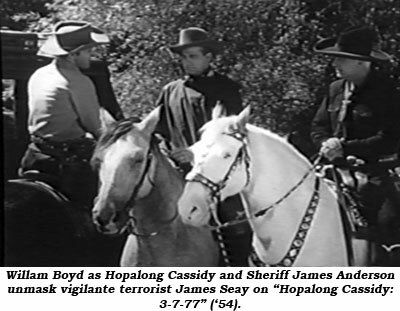 Before his military service, Seay was seen in Hopalong Cassidy’s “In Old Colorado” (‘41), “They Died with Their Boots On” (‘41), “Home in Wyomin’ (‘42) w/Gene Autry, “Man From Cheyenne” and “Ridin’ Down the Canyon”, both in ‘42 with Roy Rogers. 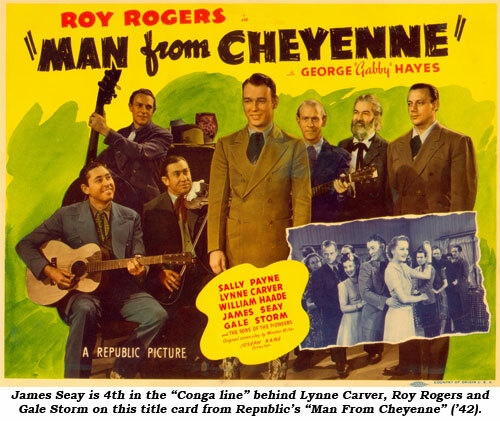 In the latter he was one of the gang leaders, a role he often played when TV westerns came along in the early ‘50s. (“Cowboy G-Men”, “MacKenzie’s Raiders”, “Cisco Kid”, “Stories of the Century”, “Buffalo Bill Jr.”, “Hopalong Cassidy”, “Tombstone Territory”, “Cheyenne”, “Tales of Wells Fargo”.) In nearly all these he fared well as a stern dress-heavy type (gambling hall owner, outlaw masquerading as a doctor, crooked attorney, town boss, Yankee traitor). Working with George Montgomery, he murdered Montgomery’s parents in “Jack McCall, Desperado” (‘53) and became a French spy in “Fort Ti” (‘53). 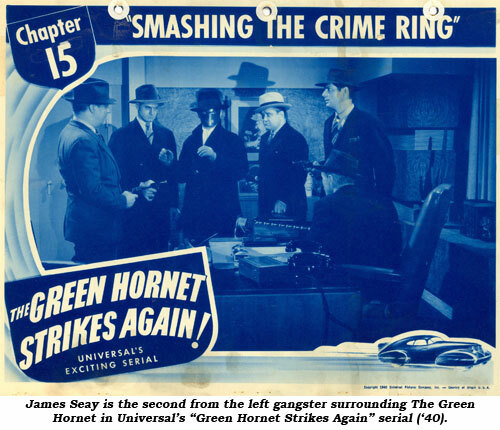 Throughout the ‘50s and ‘60s Seay mixed his western roles with dramas, sci-fi and detective fare. 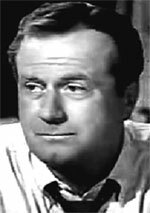 His talent and longevity eventually led him to two recurring TV roles, as Sheriff Davis on “Fury” (‘55-‘60) and as Judge Spicer in the Tombstone episodes of “Wyatt Earp” (‘59-‘61).